As part of my daily read across the blogosphere, I came across Sati’s latest Blogathon effort, White Swan/Black Swan, in which a character with opposing personality traits is examined. Based on the duality of the film Black Swan, by Darren Aaronofsky, Sati’s Blogathon highlights many great characters who are different in one part of their lives than they are in another. It’s a great idea for a Blogathon, so I figured, hell, why not participate. Therefore, here is my entry. 1. Choose max 3 characters to write about. 2. You can also feature characters from TV series. 3. We are not looking for doppelgangers – we are looking for one person with two sides. For example in Black Swan you can write about Nina and her alter ego but not about Lily and Nina, which are two different people. You can write about Gollum/Smeagol but you cannot write about Bette and Dot – the Siamese twins from AHS: Freakshow – because technically they are two different people. 5. Provide a theory on what causes the two different sides and what are the signs and contradictions between the two. The first I read about Sati’s idea, the only character I had in my head was Harvey Dent from the Batman franchise. Perhaps the most literal iteration of the clash of two ideologies, Harvey Dent (or Two Face, as he comes to be known in his villainous transition) is another of Batman’s foes born of a tragic origin. 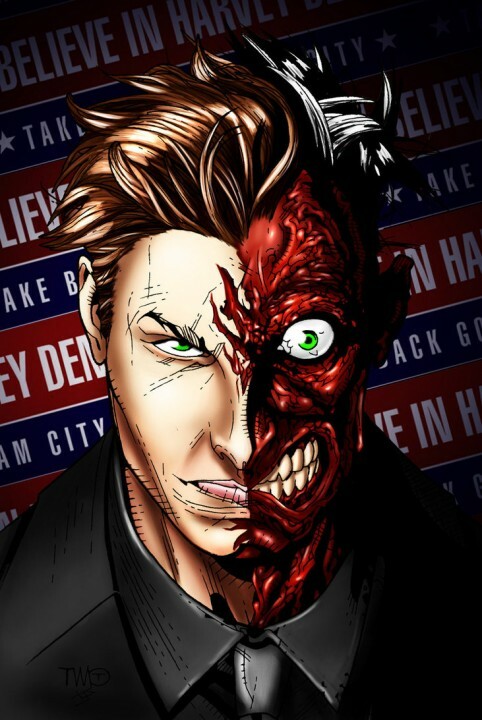 Initially, Harvey Dent was a force for good in Gotham City’s law enforcement community. As the District Attorney, Dent’s reputation for imprisoning criminals was of the highest order. However, after having his face splashed with acid (comics book and film accounts differ wildly, but the effect is the same), the change in Dent’s personality changes utterly. He becomes obsessed with luck, the flip of a coin to determine the fate of his many victims, and this split personality disorder causes mayhem for Batman and the denizens of Gotham. Two Face in animated form. 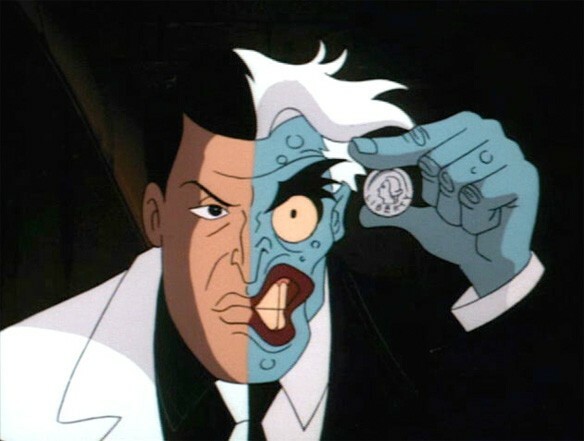 In the comics, Harvey Dent’s reliance on the defaced coin to make his decisions came from (among differing origins) an abusive father who used the coin as a “game” before beating his son each night. The concept of free will – as opposed to fate – is largely Dent’s motif, although while an attorney was considered quite the “white knight” for tackling Gotham’s crime. He was at one point even an ally of Batman’s, before an encounter with a vial of acid while inside a courtroom caused one half of his face to become horribly scarred. This damage to his physical form mirrored his fracturing emotionally, as his encounters with Batman showcase the definition of his fight for and against corruption, in many ways the very opposite of Batman’s fight against crime. In film and television, Dent’s appearance and characterization has largely followed the villains own mental state – the character never appeared in the 60’s camp Batman television series, after deemed to “grotesque” for a family oriented show (and yet they had the Joker in it…. oh well), and his primary adventures came with the popularity of the animated Batman series throughout the 90’s and 00’s. It’s in film the character is most closely identified, portrayed by actors of the caliber of Billy Dee Williams in Tim Burton’s Batman (purely as the DA character, not the Two Face character), Tommy Lee Jones (in Batman Forever, partnering with Jim Carrey’s Riddler), and most recently with Aaron Eckhart’s digitally enhanced version in Christopher Nolan’s definitive take on the man, in The Dark Knight. 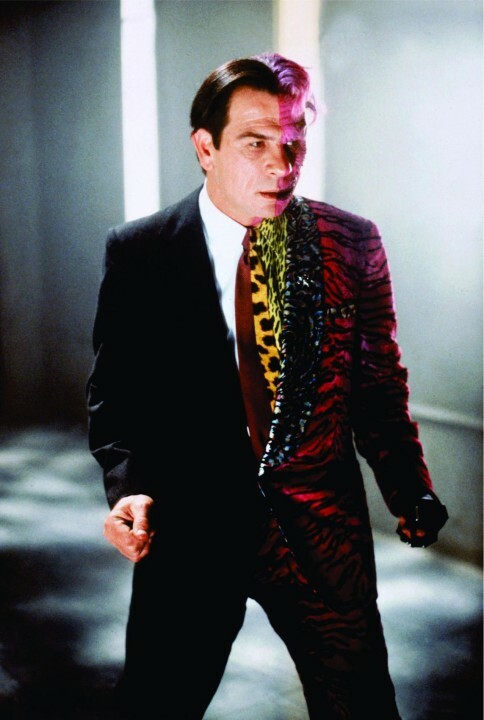 Tommy Lee Jones as Two Face, in Batman Forever. Dent’s white swan, black swan personality has proven to be the hardest to get right on screen (the comics have provided plenty of great stories). Tommy Lee Jones’ portrayal in Joel Schumacher’s camp variation on the Batman mythology is largely overshadowed by Jim Carrey and the glut of superstar performances within that film, and his backstory is given exceptionally short thrift inside that world’s development. Nolan’s version is perhaps the most identifiable, creating a Bad Guy out of a Good Guy with emotional heft, and the weight of tragedy thrusting him into the spotlight, as the character’s rescue at the expense of his love interest (Rachel Dawes, played by Maggie Gyllenhaal) at the hands of the maniacal Joker. This incident causes Dent to generate a hatred of choice, ironically his mantra following his escape from hospital (his face badly scarred by fuel and flame during an explosion) and his confrontation with Batman, who appeals to Dent’s “good side” is one of that films most beautifully sad moments. Aaron Eckhart’s portrayl of Harvey Dent, in The Dark Knight. The thing about Harvey Dent’s story, and to an extent many of Batman’s foes generally, is that he’s driven my mental issues, rather than physical ones. His “evil” comes from a place that we cannot access, we cannot correct, and this makes him among the most eloquently tragic of all comic book villains. In doing the right thing, his life is destroyed. Thus, he resolves to destroy life in retribution. 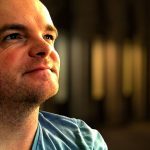 So sorry for being late to read your entry! Love the choice – Batman is actually full of villains with such interesting dual personas, Harvey being the most famous one. I really liked Eckhart in the role, but I wish the make up was a tad more realistic. Thank you so much for participating! 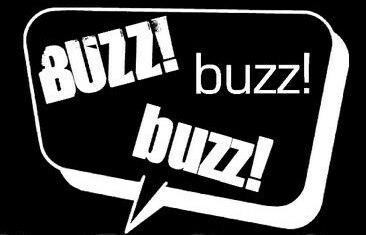 No worries Sati, thanks for the great idea for a blogathon! Film - General	Is Over-Promotion Killing Movies?